Urban Design, Engineers, Quantity Surveying or Building Product industry, then this BIM Conference is for you. If you are a Design Student or intern in the Architecture, Interior Design or Urban Design field, then “EVENT 2” at our 2014 BIM Conference is for you. Elevate your skills & open real career opportunities as you meet with professionals! This event if for professionals and students alike! Learn how to profit from the latest developments in “BIM”. Open doors at Accredited Training with other Pro Users. Discover new possibilities as you get the most out of “BIM”. Tools & tips to automate your SANS204 / Energy Evaluation. Meet with professionals and industry leaders. Refreshments and Lunch (see details). and expect everyone to benefit from the experience. Click here to Contact us any time for more info. 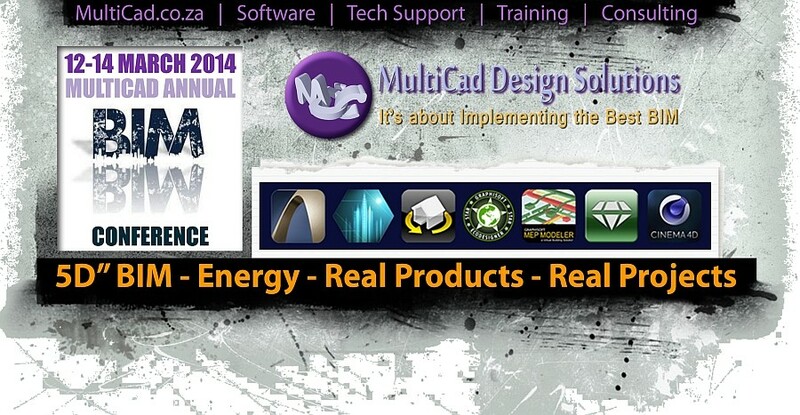 MultiCad 2014 BIM Conference - Western Cape. Please refer below the table for more details and booking form for each item. Pro User Training and test continued. This Accredited "ArchiCAD Level 3 / 4Training course" (12 Hours) will be presented. Laptop / computer with ArchiCAD 16 or 17 and Adobe Reader installed. Tables, Chairs and electrical plug point will be available for each attendee. Each of these Level courses has a pre- requisite (L3 = min. 60% | L4 = min. 70%). www.graphisoft.com/learning/online_certification and submit a screenshot of their result with their booking. The booking numbers per level will determine which course we will present at this conference to meet the majority need. (please contact Francois francois[at]multicad.co.za if you want training on specific aspects). This Accredited "ArchiCAD Level 3 Training course" (8 Hours) will be presented. Studio Computer with ArchiCAD 16 or 17 and Adobe Reader will be available on campus. SESSION AGENDA: Level 3 accredited courses. Each of these Level courses has a pre- requisite (L3 = min. 60%). In this session we will be brain-storming the subject of "Making IFC Collaboration work for your projects" in an informal and interactive workshop. Everyone may contribute, share ideas and ask questions. In this session we will be discussing the subject of what BIM is and how it is applied in practice. We will also look at how far / wide BIM can "reach" into the life cycle of an Urban and Building design project. There will be time to ask questions with each item on the agenda below. Attendees can bring a note book and pen (no computer are needed for this session). Localized ArchiCad Tools: Graphisoft SA and Large Architects present the launch (or pre- launch) of the “Smart-XA Tools for ArchiCad” (by Shawn Hopkins). Sustainable Design: EcoDesigner STAR background by (Francois Swanepoel and Jean de Beer) Note: this will be a basic introduction with the detail in the next session (item 9). NBR "Part XA" will be compared in the context of BIM. Everyone may contribute, share ideas and ask questions. (see MAP and directions in sections below). Energy Efficiency in Buildings: A background of the legislative requirements. Confirming your booking implies acceptance of the following conditions and notes. All bookings must be confirmed before or on the date set for close of bookings (see event details for dates). After completion of the online booking request form on this website, MultiCad will issue an invoice for all bookings together with a final event agenda (where applicable). A bookings is only confirmed after completion of the booking form; receipt of proof of payment (where applicable) as well as uploading of "IT", "Tech Support" and/or "Training Coupons" (where applicable or requested by MultiCad). The "IT COUPON" is required from all SSA Clients attending any session of this conference. The "TECH-SUPPORT COUPON" is required from all SSA Clients attending Event 3 (session 4), 4a & 4b (session 5 & 6) of this conference. The "TRAINING COUPON" is required from all SSA Clients attending Event 1 (session 1 & 3) of this conference. The "ONLINE TEST RESULT" is required from everyone attending Event 2 (session 2) of this conference. SSA Clients* as refers in the above relates to SSA Clients who receive their quarterly or annual SSA invoices from MultiCad Design Solutions. Non-SSA Clients** as refers in the above relates to non ArchiCAD users and SSA Clients who receive their quarterly or annual SSA invoices from other Graphisoft SA Resellers. Inquiries for your booking can be e-mailed to nikki@multicad.co.za. Cancellation of a booking must be faxed to 086 515 4965 or e-mailed to reach nikki@multicad.co.za not less than 1 day before the booking close date. All bookings cancelled before the booking close date will attract a non-refundable handling fee of 25%. All invoices will be C.O.D. and interest of 2% per annum above current prime rate (local currency) at that time will be charged on any overdue amounts. Parking at all venues will be used at attendees own risk. Use of computers, laptops and other devices or equipment will be at attendees own risk.